Originally published in 1944 as Kansas Geological Survey Bulletin 52, part 4. This is, in general, the original text as published. The information has not been updated. An Acrobat PDF version (13 MB) is also available. This paper summarizes knowledge of the outcropping rocks of Kansas, indicating in tabular form their present classification and nomenclature. Range in thickness and average thickness of each described unit, based on observation of outcrops but not on subsurface data, are indicated. It is the purpose of the contribution to make available a compact outline of the stratigraphy of the Kansas region, as represented by exposed formations. 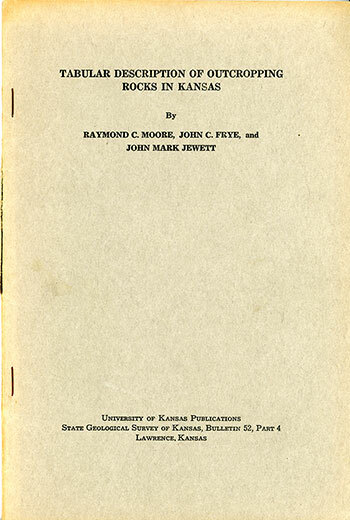 References to important publications that offer detailed treatment of various rock divisions in Kansas are arranged by main parts of the geologic column. Placed on web Jan. 18, 2017; originally published Oct. 25, 1944.